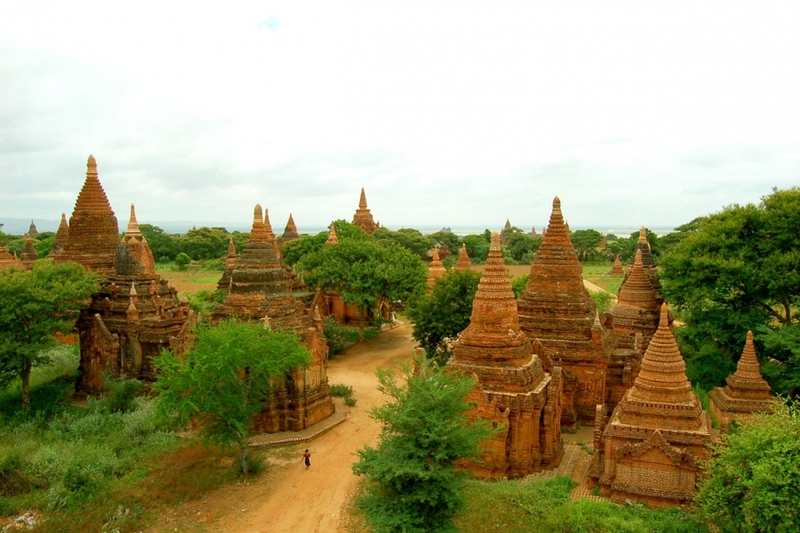 Bagan, formerly Pagan, is an ancient city in the Mandalay Region of Burma. Formally titled Arimaddanapura or Arimaddana (the City of the Enemy Crusher) and also known as Tambadipa (the Land of Copper) or Tassadessa (the Parched Land), it was the capital of several ancient kingdoms in Burma. It is located in the dry central plains of the country, on the eastern bank of the Ayeyarwady River, 90 miles (140 km) southwest of Mandalay. The ruins of Bagan cover an area of 16 square miles (41 km2). The majority of its buildings were built in the 11th century to 13th century, during the time Bagan was the capital of the First Burmese Empire. It was not until King Pyinbya moved the capital to Bagan in AD 874 that it became a major city. However, in Burmese tradition, the capital shifted with each reign, and thus Bagan was once again abandoned until the reign of Anawrahta. In 1057, King Anawrahta conquered the Mon capital of Thaton, and brought back the Tripitaka Pali scriptures, Buddhist monks and craftsmen and all of these were made good use of in order to transform Bagan into a religious and cultural centre. With the help of a monk from Lower Burma, Anawrahta made Theravada Buddhism a kind of state religion, and the king also established contacts with Sri Lanka. In the 12th and 13th centuries, Bagan became a truly cosmopolitan centre of Buddhist studies, attracting monks and students from as far as India, Sri Lanka as well as the Thai and Khmer kingdoms. Among many other works, Aggavaṃsa’s influential Saddanīti, a grammar of the language of the Tipiṭaka, would be completed there in 1154. In 1287, the kingdom fell to the Mongols, after refusing to pay tribute to Kublai Khan. Abandoned by the Burmese king and perhaps sacked by the Mongols, the city declined as a political centre, but continued to flourish as a place of Buddhist scholarship. After the earthquake in 1975, there are only 2,217 pagodas left in Bagan, in contrast to more than 5,000 during height of the political centre. Thus in order to preserve the original pagodas, only horse-driven carriage are allowed to travel among the pagodas.